Why Replace Your Loft Insulation? Heat rises, and in an uninsulated home, up to 25% of heat is lost through the roof. Insulating your loft, attic or flat roof is a simple and effective way to reduce heat loss and reduce your heating bills. 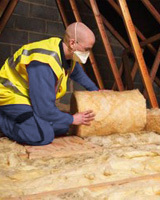 Loft insulation is effective for at least 40 years and it should pay for itself many times over. The material may have become damaged with wear and tear, or simply degraded with time if it was laid some years ago. Badly fitting or loose insulation material will allow heat to escape. Water damage due to roof leaks or burst tanks/pipes. Electrical or plumbing work carried out in the loft space may have resulted in damage or improper replacement of material. If your loft has been subjected to woodworm treatment and the old insulation was not removed first, it may have suffered during the treatment. Again this can result in inefficient insulation. Get a free quote online to replace or install loft insulation now. The first step is to contact us to arrange an inspection of your loft. We can then advise you as to what is needed to be done, and arrange a suitable date for the work. When we remove your old insulation, we always ensure that we work as cleanly as possible. Whenever we can, we will bag up old insulation in the loft (or hoover up and bag if it is beads/loose material). All old material is taken away with us when we leave, and you can rest assured that no mess is left behind. If woodworm treatment is required, this will be done before any further work is undertaken. It is estimated that over 60% of us use our lofts for storage. While this is a convenient way to hide all those suitcases and other items, it can also damage your loft insulation. 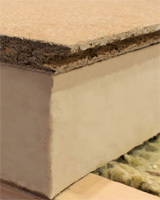 When compressed, mineral wool insulation becomes much less effective. Simply boarding over your insulation can have a similar effect if you are using the currently recommended depth of 270mm insulation, as most joists are only 100mm deep. We specialise in fitting raised boarding, up to a depth of 300mm, to ensure that your insulation material has maximum effect while your boarding provides the ease of access and storage that you need for everyday use. Once we have insulated your loft as instructed, any finishing off work such as boarding, walkways or storage units are completed to your satisfaction. You can then sit back and relax in the knowledge that your loft is now properly insulated and plan on what to do with the savings you will make*. *The average saving that proper loft insulation provides to householders in the UK, is approximately £175 per year. This can be more than doubled by ensuring that you have correct cavity wall insulation too! There are great savings to be had from installing loft insulation and it should pay for itself many times over. Use the table below to get a guideline on how much you could save. Estimates based on insulating a gas-heated home with either a totally uninsulated loft, or topping up existing insulation from 120mm to 270mm. All data obtained from the Energy Saving Trust (EST). All of our work is guaranteed, and is carried out by qualified professionals. See our information page to learn about insulation replacement. We also do repointing and brickwork.